Next week, NASA will begin attempts to revive the frozen PhoenixMars Lander, which has been coated in ice in the Martian arctic for more than ayear, to see if it can live up to its name and rise from the ashes. The solar-powered spacecraft landed in the northern reachesof Mars on May 25, 2008, and spent five months digging up the Martian dirtlooking for waterice, which it found just below the rusty red surface. The finding hasimplications for the possible past existence of life on Mars. Beginning Jan. 18, NASA's Mars orbiter Odyssey will listenfor possible, though improbable, radio transmissions from Phoenix. Missionmanagers aren?t optimistic on the lander?s chances. "We do not expect Phoenix to havesurvived, and therefore do not expect to hear from it. However, if Phoenix is transmitting, Odyssey will hear it," said Chad Edwards, chieftelecommunications engineer for the Mars Exploration Program at NASA?s JetPropulsion Laboratory, Pasadena, Calif. "We will perform a sufficientnumber of Odyssey contact attempts that if we don?t detect a transmission from Phoenix, we can have a high degree of confidence that the lander is not active." Phoenix lasted two months longer than its original plannedthree-month mission, finally succumbing to the increasingly cold temperaturesand coatings of ice in November 2008, when mission managers lost contact. 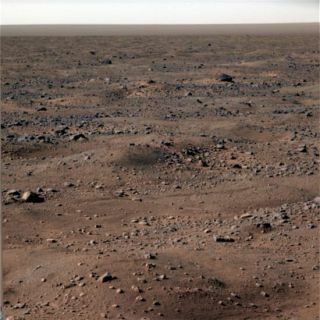 In the extremely unlikely case that Phoenix survived the Martianwinter, it is expected to follow instructions programmed on its computer.If systems still operate, once its solar panels generate enough electricity toestablish a positive energy balance, the lander would periodically try tocommunicate with any available Mars relay orbiters in an attempt to reestablishcontact with Earth. Odyssey will pass over the Phoenix landing siteapproximately 10 times each day during three consecutive days of listening thismonth and two longer listening campaigns in February and March. The amount of sunshine at Phoenix?s site is currently aboutthe same as when the lander last communicated, on Nov. 2, 2008, with the Sunabove the horizon about 17 hours each day. The listening attempts will continueuntil after the Sun is above the horizon for the full 24.7 hours of the Martianday at the lander?s high-latitude site. If Odyssey does hear from Phoenix, the orbiter will attemptto lock onto the signal and gain information about the lander?s status. Theinitial task would be to determine what capabilities Phoenix retains,information that NASA would consider in decisions about any further steps.